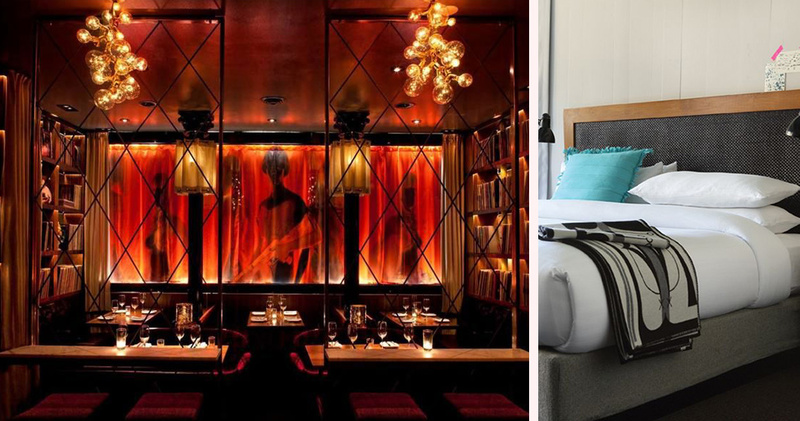 Visited by bands such as the Red Hot Chili Peppers, Phoenix Hotel has a funky and retro style. 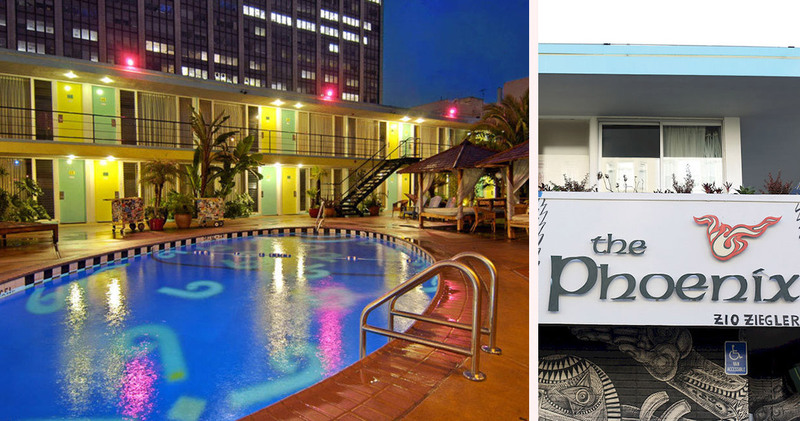 Located in the gritty Tenderloin District, Phoenix Hotel is close to the Civic Center and the Civic Auditorium. 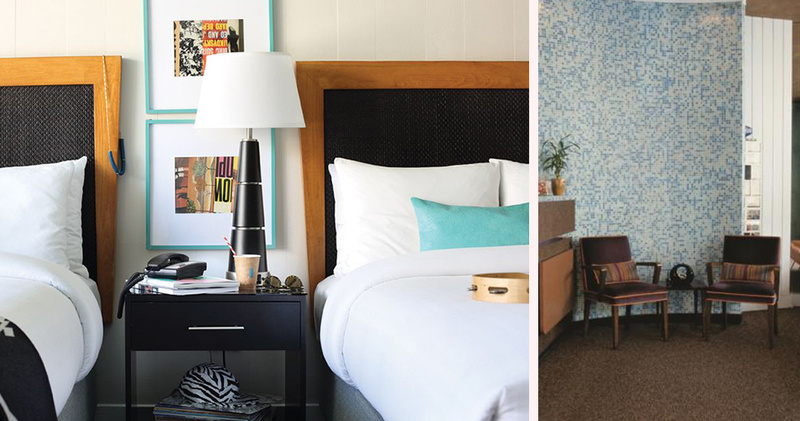 This mid-century, trendy motor lodge has been frequented by bands like The Killers, Pearl Jam and Red Hot Chili Peppers. 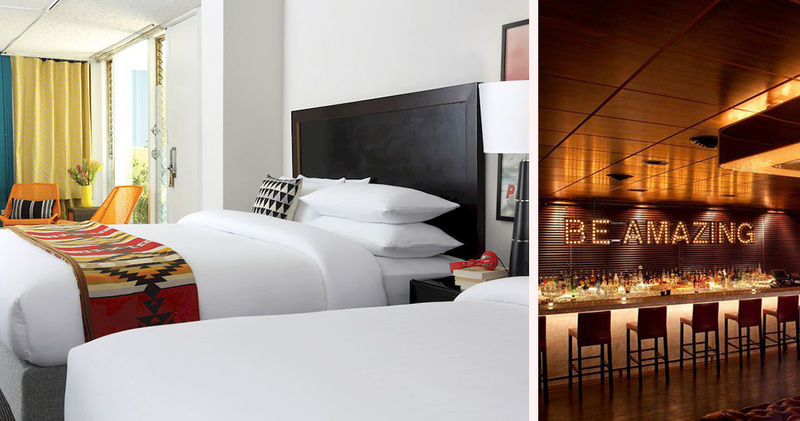 The hotel is a stylish, retro space designed around a courtyard. 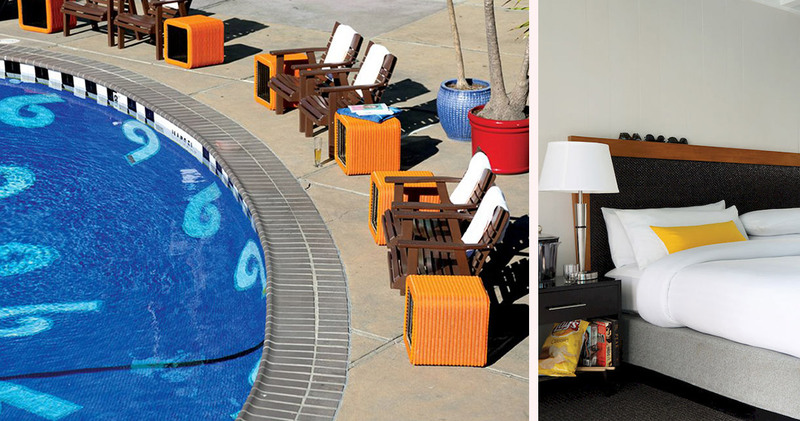 The fifties design, tropical looking courtyard and colorful local artwork create a chic and charming atmosphere. 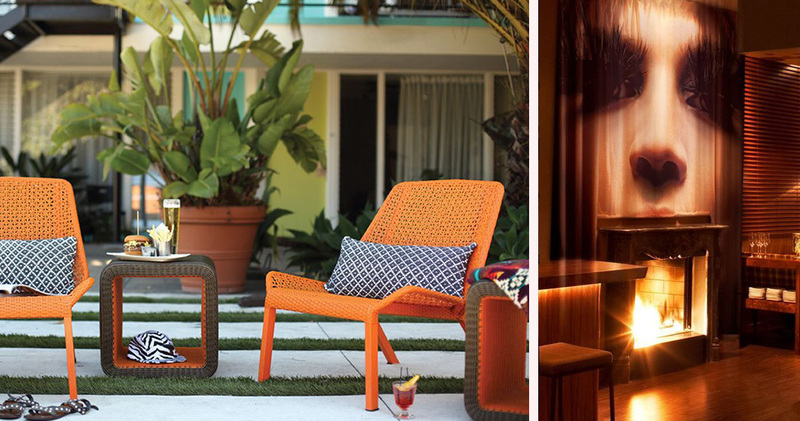 Phoenix Hotel San Francisco lobby has a fun decor with vibrant splashes of color. The heated, outdoor swimming pool features a beautiful Francis Florenza mural. 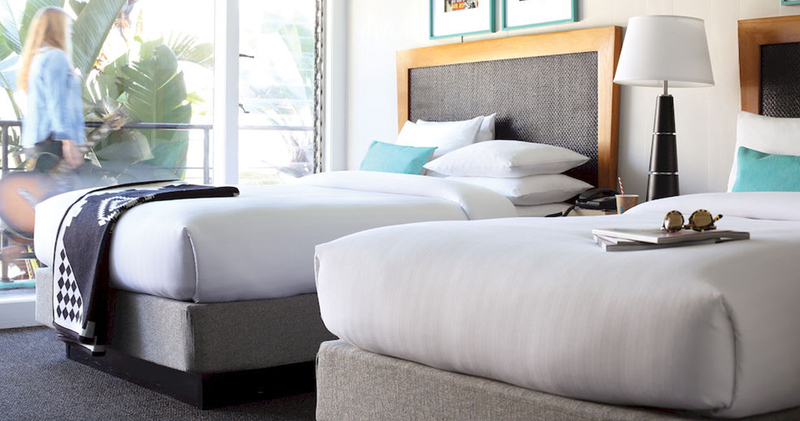 The guestrooms at Phoenix Hotel enjoy a casual, bungalow style. The decor is stylish, chic and retro with large, comfortable beds, a spacious work desk, a dresser and a retro ceiling fan. The large windows provide ample natural light along with views of the tropical central courtyard and pool. 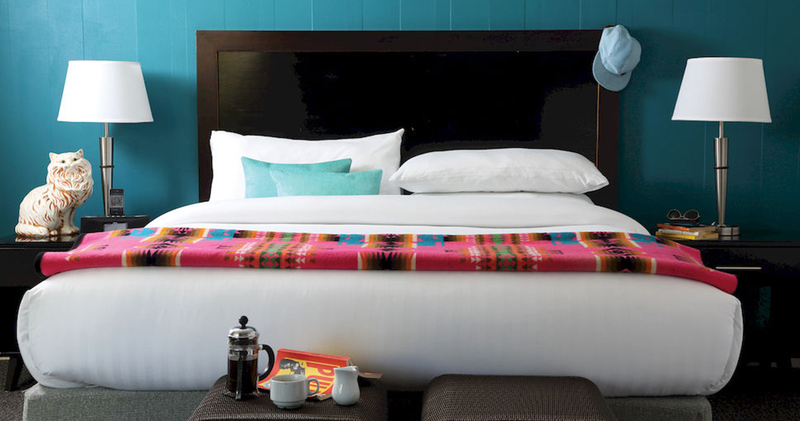 The rooms at Phoenix Hotel San Francisco have a fun and playful style, with bright splashes of orange, blue and teal. The bathrooms are simple and feature a pedestal sink, colorful shower curtain and good lighting. Phoenix Hotel is home to the Chambers Restaurant. 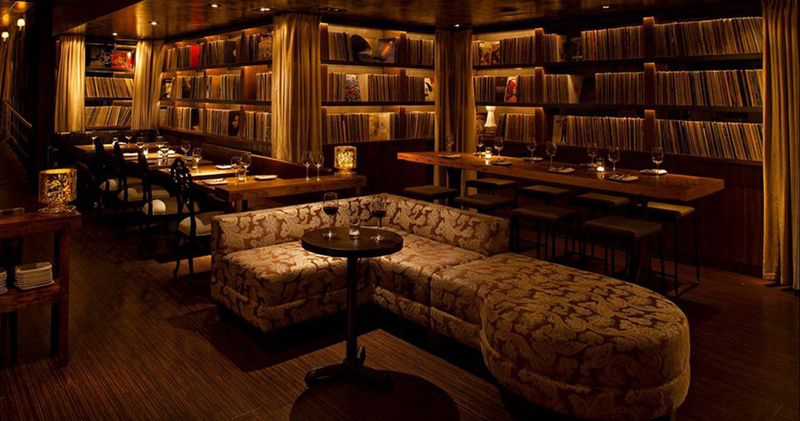 This musically inclined, understated restaurant features a mix of mid-century modern and vintage rocker décor, with record albums on the walls and low key lighting. Chef Trevor Ogden serves a market-driven, seasonal menu along with drinks that can be enjoyed in the cabana, patio, poolside or lounge. Home to imposing government buildings and beautiful architecture, the Civic Center neighborhood of San Francisco offers visitors a wide variety of cultural attractions to explore. The area is popular with tourists for its museums, opera houses and auditoriums. Visitors based out of the Civic Center neighborhood will find beautiful architecture everywhere with buildings like the City Hall, the Main Library and Alcazar Theater. Those interested in performing arts will find excellent shows at the Bill Graham Auditorium and the SF Performing Arts Center. Civic Center is home to a large number of attractions to explore such as the Asian Art Museum and the Civic Center Plaza.